Smoke Free Kings is dedicated to working within established tobacco control practice. Smoke Free Kings is an organization made up of professionals and volunteers committed to reducing harm related to tobacco use and exposure to tobacco smoke in Kings County, Nova Scotia, Canada. We work in community to change how we think about and act on tobacco use. The video on the right introduces you to Smoke Free Kings and talks about our smoke free vehicles work. Tobacco free public policy advocacy is an exciting and complex process. We are excited to share our public policy work with you. We supported the Town of Wolfville in becoming the first town in Nova Scotia to adopt an smoke-free public places bylaw which led the way for Provincial Smoke Free Places legislation. 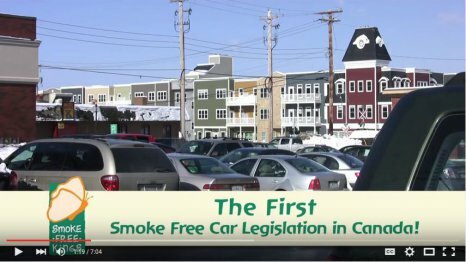 Following that success, we encouraged and worked with Wolfville to adopt a smoke free vehicle bylaw. They were the first town in Canada to take action on protecting children in vehicles from second hand smoke. This was very quickly supported by the Province of Nova Scotia with a smoke free vehicle amendment to their Smoke Free Places Act. We are now beginning work on outdoor public spaces. Smoke Free Kings is dedicated to working within established tobacco control practice and is guided by up-to-date research and advice. Want to be involved in this very rewarding work? Contact us.